Earlier this week I was sent an email by Patricia Maier. Patricia explained how she was using 40 Things to Give up for Lent as an aid in her devotion time. She is using a technique called praying in color to meditate on the message each day. I copied her email below along with some pictures she has shared on Facebook. 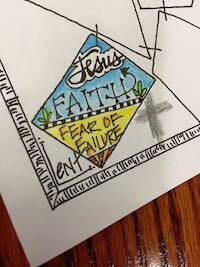 I’ve attached my own design for a Lenten “Praying in Color” Calendar. Praying in Color, along with Bible Journaling, fall under the umbrella of “visual faith.” Educators point out that the most effective way of learning for many people is through visual and kinesthetic processes (hands-on learning) allowing information to be impressed on our memories. Images also are easily brought to mind by the Holy Spirit later on for further blessing. I just meditate on a verse or devotion each day, and then add a word, image, or color to represent God’s Word to me that day. Praying in this manner is actually a “tool” to help you connect to God’s Word in a visual and kinesthetic way, creating a picture in your mind to help you remember and look back at your time with God. Besides my devotional word or image, I like to write the names and situations I’m personally praying for in the spaces and around the edges. If someone asks me to pray, I can write it down so I won’t forget. It also leaves me with a picture of my prayer time with God ~ I can look back at it and see His faithfulness. For the design, I took the cross apart in four shapes……wanted to create a path to follow the broken pieces through Lent to Good Friday, where Jesus takes all our brokenness to the cross and we are made whole…. If you want to explore a little more about Visual Faith, you can see lots of examples on Pinterest (check Connie Denninger and Patricia Maier). Connie and I have lots of examples on our boards titled Praying in Color, Visual Prayer, Bible Journaling, and Bible Marginalia. Connie often links hers to her blog posts which explain the processes. It’s overwhelming how much this connects to people! One more fun fact: did you know that J.S. Bach wrote in the margins of his Bible….and that his Bible is in the library of Concordia Seminary in St. Louis? I read about that in a book on Bible marginalia – Writing in the Margins by Lisa Hickmann – GREAT book! 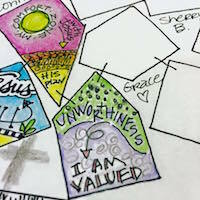 Thanks Patricia for sharing this exciting way to connect faith and art together! Let us know in the comments if you find this beneficial in your own devotion time. I really like this idea – I have a bright calendar (Always Color Outside the Lines) with mostly blank squares & I can use that to fill in. Thank you for sharing your idea. I have trouble with blank spaces, and in the calendar above I just colored in the squares for days when there wasn’t a devotion & word. 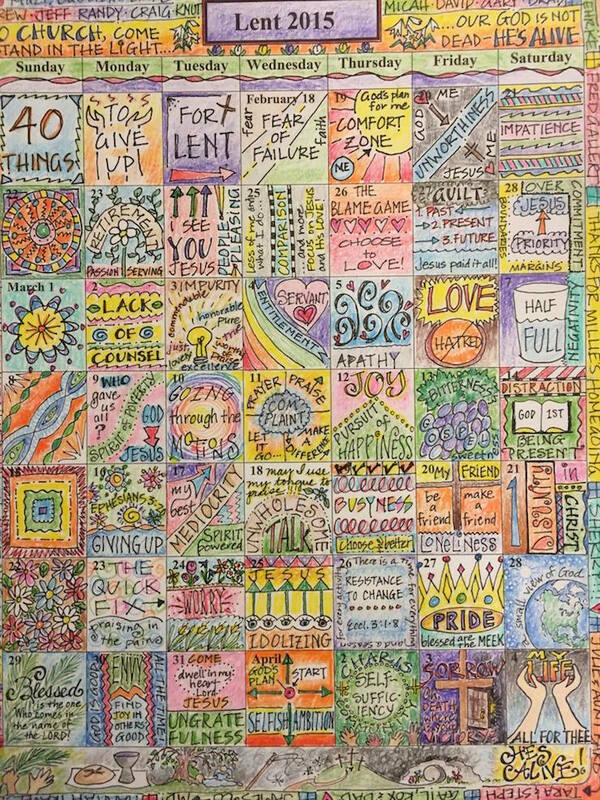 In the calendar I drew this year, there are 44 broken pieces that take us through all the days from Ash Wednesday through Maundy Thursday. So on the Sunday’s I’ll just respond with a word from a sermon or prayer on my heart – thought I should point that out for people like me who might be upset to get to the end and have unexpected extra spaces! Added the cross-altogether for Good Friday, the stone for Holy Saturday, and the empty tomb/Jesus Lives for Easter Sunday…easy to color in before or after on busy days of blessing and worship and family time. Beautiful! Thank you for sharing these ideas! Thanks for sharing. 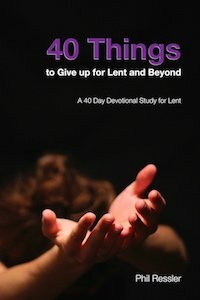 I will be sharing a new series this year called 40 Things NOT to Give up for Lent.